Good afternoon. Thanks for joining this week's live chat. I hope you've all had a wonderful week. Fire away. Hey Jose- Since it doesn't happen often I thought some credit should go to MO. Signing Norris looks like a great move so far. And with Gregerson returning and figuring Holland will get right once he's had some more time this is shaping up to be a potentially very good bullpen for the Cardinals this season. And Hicks, wow! Yes, you are absolutely correct. 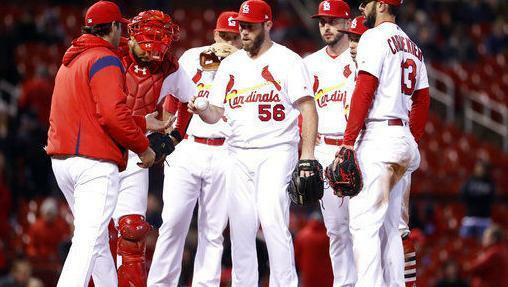 This Cardinals bullpen could be special once Holland gets straight. Bud Norris has been a godsend to the Cardinals, especially if you consider that Gregerson wasn't activated from the disabled list until this week and Brett Cecil has been on the disabled list most of the season. John Mozeliak and Michael Girsch deserve a lot of credit for signing Norris. They were willing to give him a big league contract when others weren't. Any chance Holland will take his spring training act somewhere else very soon? It would have to be his idea. The Cardinals believe they can give him the opportunities necessary to work himself into form in the majors, but I bet they would be open if he suggested it. The fact that he would need to stay down 10 days in the minors if he accepts an options makes it a bit of a gamble, but it's not an unreasonable request. As of 1 p.m. the Cardinals had not informed the player who will be sent down to make room for O'Neill. Moreover, I'm not in Chicago with the team, so I don't have an update on Pham's health status. I wouldn't be surprised if the Cardinals went with 12 pitchers and 13 position players if they think that Pham doesn't need to be on the disabled list. Who goes down with O'Neill coming up? I checked in with people who would know, and I've been told the Cardinals haven't spoken yet with the player who will be in the move necessary to make room for O'Neill to come up from Class AAA Memphis. If Pham is injured and has to go on the 10 or 15 day DL, does Fowler move to CF (praying not) or does Bader or O'Neill start in CF? That is a good question. Fowler hasn't played center field this season, but I don't know how comfortable the Cardinals would be with O'Neill in center field. Keep in mind that O'Neill has played all but one of his games at Memphis this season in left field. He played the other in right field. If Bader remains, I wonder if he'd be the best option to start in center field. But if the Cardinals bring O'Neill up to start consistently, I assume the best move would be to have Fowler in center, O'Neill in right and Ozuna in left. Why did it take the Cards so long to realize you don’t need 8 relievers in April with every other day a rainout or off day? Surely Matheny didn’t come to this decision, MO must have finally pushed it. Would you agree? I don't think anybody in the big leagues could have predicted these many rainouts this early in the season. Does J. Martinez take extra fielding practice (hopefully everyday)? Jose Martinez does work on his defense. Kudos to the FO for recognizing the talent of Bud Norris and taking a chance on him. I certainly didn’t see it. Of all the adds in the off-season, he has had the most positive impact of any out of the gate. Would you agree? The Bud Norris signing is one of the best under-the-radar signings in baseball so far. He's been a godsend to the Cardinals. Good Afternoon! So, Tyler O'Neil is being called up tomorrow and if Pham checks out, word is a reliever will probably be the one sent out. Most likely candidates I would think would be Holland to continue his "Spring" (my hope) and Brebbia to get work (most expendable and least used). Who do you think is the most likely candidate? If Pham is healthy, you can assume it's going to be a reliever. Unless Holland decides that he wants to go work himself back into form in the minors, you can almost safely assume that the last reliever called up will be the one sent down to make room for O'Neill if the Cardinals decide to go with seven relievers. Bud Norris is looking like a steal thus far. Also, I agree with you about Holland, he needs to get in form before they keep throwing him out there. Yes, Bud Norris has been outstanding. He's 4 for 4 in save opportunities with a 1.93 ERA and 17 strikeouts over 9 1-3 innings. He's played a key role in seven of the Cardinals' 10 victories so far, finishing half of the victories and six games overall. Even though the Cardinals signed him as a potential closer, I don't think they would have expected that he would play such a significant role in the first month of the season. Jose - Are you concerned Matheney will overuse Hicks as he has done with several relievers in the past? Mike Matheny and pitching coach Mike Maddux are closely monitoring Hicks' workload. I expect they'll monitor his workload closely all year. Regarding Greg Holland: If you freeze frame his pitch that left the park yesterday, he is not concealing his grip on the ball. It appears to me that his knuckle is up and by exposing the grip will allow the hitter to expect a pitch to break. That's my take on it. Go Cards! Interesting. I hadn't noticed that. With o niel coming up who goes down? Can they talk holland into getting right in Memphis? It's unclear yet. As I've noted, Holland would have to decide that he is willing to go down to work himself back into form. The Cardinals cannot send him down without his permission. Why do they keep using Lyons as specialist, he's gotten guys out from both sides of the plate pretty consistently over the last few years? He's the only healthy lefthander on the pitching staff right now. With Gyrko back and Carpenter can't throw, it's time to give Wong a rest and put Carp back at second. Wong is turning into an automatic out. It will be interesting to see how much patience the Cardinals show with Wong overall and Carpenter in the No. 3 spot. For all of the whining about Carpenter, he has driven in some crucial runs over the last two weeks. He was the late hero last night, and don't forget his walk-off blast last week. He's better suited defensively at second or first. Gyorko at third would provide much better defense. I know Hicks got out of the inning 1-2-3, but he had all three hitters 0-2 or 1-2 and threw meat up to the plate. The Cubs hit him hard but luckily right at somebody. Molina needs to set up way out of the strike zone. You're just being picky now. I include myself with the fans that questioned the Norris signing or believed that he would never be a factor this season. Even if he turns out just to be a bridge until Holland is ready, what a major impact he has had. Winning divisional games on the road (even against the Reds) is major for this team. It has been an encouraging week and could turn out to be huge down the line. If Pham hits the DL, who starts and where? Does Fowler move to CF (I hope not) and Bader or O'Neill moves to LF or does one of those two start in CF? If O'Neill starts, I would assume Fowler would be the best option at center. If Bader starts, I would assume the best move would be to put Bader in center and keep Ozuna in left and Fowler in right. What's your take on the Cards intent to promote O'Neil at this point? Why not fill in with Bader or let Martinez play out in a corner spot for a game or two if Pham needs to rest a couple of games? Seems like he would be better off playing at Memphis everyday. O'Neill has clearly earned the chance to play in the majors with his power display at Class AAA Memphis. He has six home runs and 18 RBIs with a .388 batting average (19 for 49) and .837 slugging percentage over 12 games at Memphis. What our the chances O'Neill actually hits a guy like Fowler out of an everyday job? I don't imagine that happening this year. Do you think that the fact that Luke Weaver has had to pitch run more than a few times over the past week will force management to drop the extra reliever?